The Mentawai patch of the Sumatra subduction zone is locked and likely to produce a large earthquake in the near future (Chlieh et. al., 2008). The potential for this patch to rupture makes it very important to estimate future seismic and tsunami hazards that may ensue as a result. To get a better idea of future hazards, a better understanding of historical earthquakes on this patch is needed. To this end, the project team will use the earthquake cycle model to estimate the historical slip distributions though inversion of the paleogeodetic data. To better understand future tsunami hazards, we need to know how the patch will rupture in the future. The low-lying coastal Sumatran city of Padang has been the object of many research and outreach efforts, especially since the tsunami of 2004. However, there remain significant barriers to linking science to risk reduction: hazard information is sometimes contradictory or confusing for non-scientists and critical misunderstandings remain. 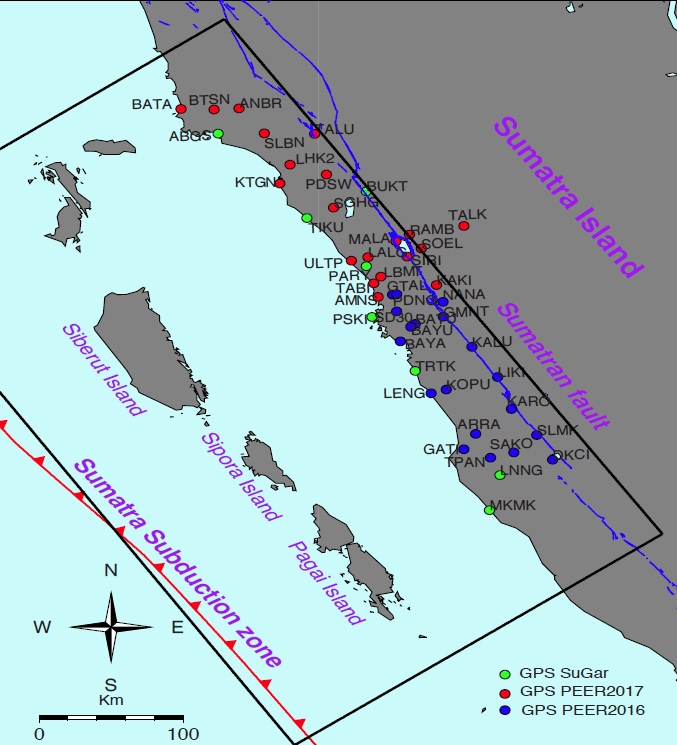 This three-year project aims to investigate and re-locate the source of earthquakes of the Mentawai seismic gap by densify the GPS network in West Sumatra. This will include training students from Bengkulu University in collecting and processing GPS data to model historical earthquakes in this region and simulate crustal deformation for earthquake cycles. They will also investigate tsunami height based on various models. To help prepare for potential future disasters, they will build partnerships among scientists, outreach workers, NGOs, and government officials in order to link science to risk-reduction practice. They will be leveraging the experience of their U.S. Government-supported partner, who has experience in methods of developing community resilience to disaster and policies for earthquake and tsunami hazards mitigation. These researchers also plan to integrate earthquake education and curriculum development into their Global Positioning System (GPS) field surveys. Most of the GPS stations they will install will be in schoolyards. Undergraduate faculty-in-training from Bengkulu University will join the GPS field teams to develop, test, and refine lessons about earthquakes and ways to reduce risk. The project team will supervise undergraduate students in designing and implementing “go school” efforts and will also provide science and teaching examples for an NGO-led program to integrate disaster-risk reduction into the Padang city schools’ curriculum. This provides an excellent opportunity for educating local communities about earthquakes because the undergraduates will serve as effective role models for the younger school students, inspiring them to stay in school and encouraging them to study science. The project team will work with the Padang government to present and explain their results, including tsunami and hazard maps, as well as an assessment of potential impacts at the district and city levels. This will help local governments in at-risk communities to prepare for natural earthquake and tsunami hazards and will contribute to redefining the science of community resilience. Attendees of the GPS data acquisition workshop at Bengkulu University. The PI instructs members of the project team on data collection (photos courtesy of Dr. Lubis). During the second quarter of 2018, Dr. Lubis and his team re-occupied the GPS monuments they had installed in the previous year. They processed the GPS data and have already obtained the vector deformations for many of the GPS stations. Although their results are preliminary they are suggesting some interesting findings that could help improve our understanding of the potential for major earthquakes in the area. In this reporting period, the researchers have also have run a tsunami simulation for the Padang region, and the results will be discussed with local officials. In May 2018, the PI and his colleagues trained 65 undergraduate students from the Physics Department of the University of Bengkulu on seismometer and GPS skills, so the students are now able to install and operate geodetic GPS equipment and a low-cost seismometer developed by the team. July 17-18, 2018, the team held another capacity building training on earthquake and tsunami mitigation in Padang city, in collaboration with a senior high school (SMA N 6 Padang). 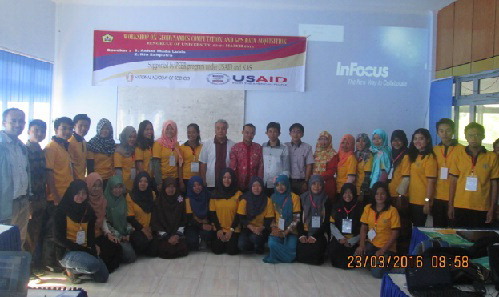 This two-day workshop provided training disaster preparedness at schools in Padang. The 45 invited senior high school geography teachers and administrators from various schools in Padang were trained on how to prepare for a potential earthquake or tsunami. LIPI (the Indonesian Institute of Sciences) sent two keynote speakers, who helped theoretical material on earthquake and tsunami mitigation at schools. The trainees were asked to consider and map the environment in which their particular schools were located, including the relative location of key infrastructure elements and vital services. Participants also learned about how to facilitate cooperation among teachers, principals, students, and members of the local community, including NGOs, the police, and the local natural hazard agency during earthquake and tsunami events. 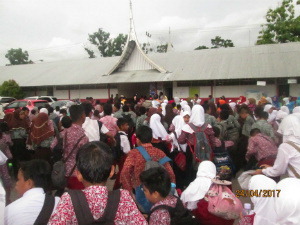 At the same time, Dr. Lubis and his group led more than 100 senior high school students from SMA N 6 Padang on emergency self-evacuation drills. Local government and police personnel also took part. In the remainder of 2018, the PI plans for further GPS surveys in the field, during which he and his team would co-locate their low-cost seismometer to gather data at several sites. Dr. Lubis will also present his work at the annual meeting of the American Geophysical Union in Washington, DC, in December 2018. A no-cost extension has been issued through September 2019 to allow sufficient time for the field work, analysis, and dissemination of the work, both through a planned publication and a meeting for stakeholders in Padang.